10 rashers of thick-cut bacon, about 1/2 a lb. 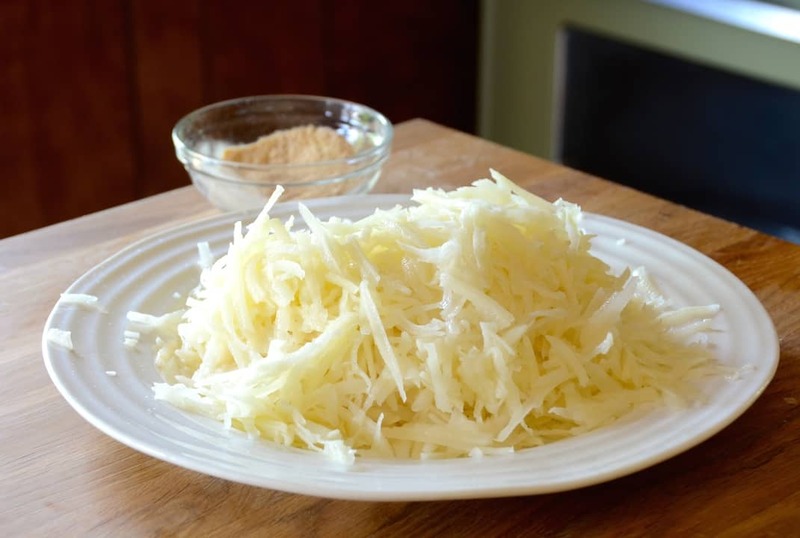 Prepare the hash browns: Place shredded potatoes into a bowl of cold water for a minute or two. Stir them about before straining. Repeat. Wring moisture out using a clean dish cloth and transfer potatoes to a medium-sized bowl. Place onion and garlic powders, cayenne pepper, salt and pepper into a smaller bowl and stir together before sprinkling over potatoes. Toss to combine. Heat oil in skillet on medium heat. Add potatoes and press them into the pan using a spatula or flat turner. Cook for about 5 minutes before beginning to break them up into smaller clumps and flipping them. Continue to cook, flipping clumps of hash browns as they brown for an additional 5 to 8 minutes. Transfer to paper towel-lined plate to remove excess oil. 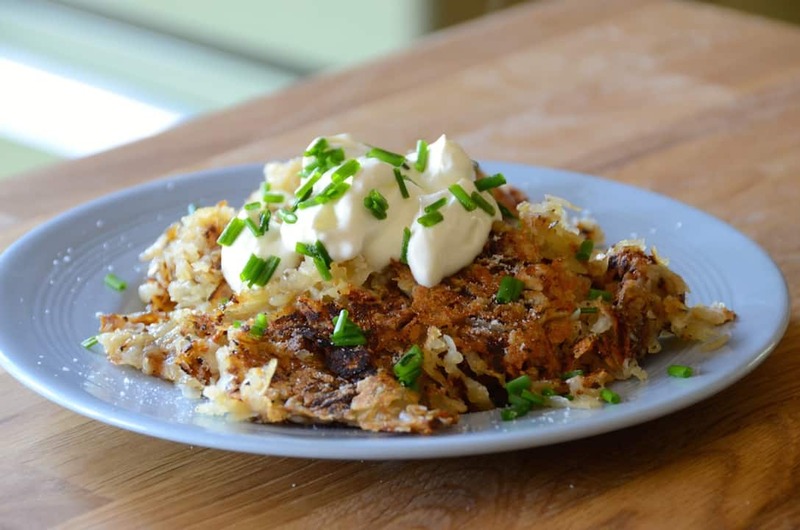 Arrange hash browns onto a serving plate and garnish with a dab of sour cream and freshly chopped chives. 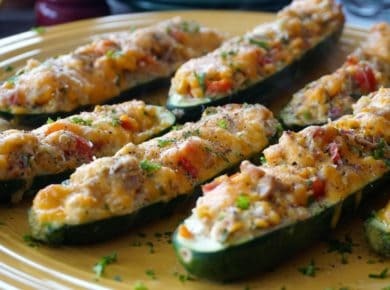 Serve with bacon and eggs. Prepare the bacon: Preheat the oven to 400°F. Line a sheet pan with tinfoil and place a wire rack overtop if available. Lay rashers of bacon onto the rack or pan, being careful to not overlap. Sprinkle with brown sugar and black pepper. Transfer to oven and bake for about 13 minutes or until bacon is crisp and fat has dripped away. Blot bacon on paper towels before serving with eggs and hash browns. Prepare the eggs: Melt butter in a medium-sized skillet over medium-high heat. Crack eggs, in pairs, into small bowls. When butter is melted and bubbling, carefully pour eggs into pan, season with salt and pepper and cook for about a minute or until central egg whites begin to turn opaque. Carefully, flip eggs over. Cook for an additional 30 seconds to a minute. Transfer to plate and serve with bacon and hash browns. Prepare toast: Toast bread to desired doneness. Butter and slice each piece in half and serve on the side. Dreaming of the perfect breakfast? 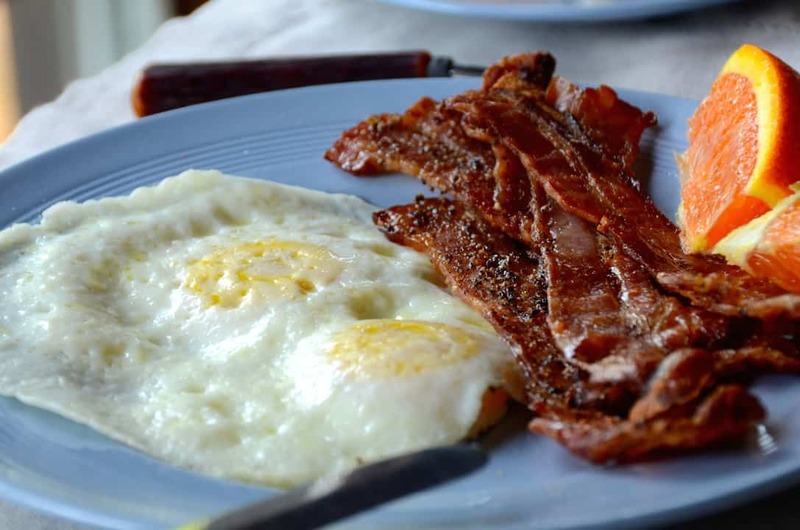 Check out our step-by-step guide on how to make the CLASSIC COTTAGE BREAKFAST OF BACON AND EGGS. I better say it right from the get-go – you’re not just learning how to make BACON AND EGGS, but also my proven way of preparing crispy, tasty hash browns too! Grab your favourite morning libation, whether it’s coffee, tea, juice or a smoothie, and settle in, ‘cause I’ve got some ‘splaining to do. 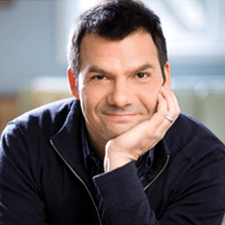 Much of the success of this rewarding breakfast endeavor will come down to two key factors – organization and timing. Because both are equally important, I’m going to write both this intro and the instructions, in sequential order. I encourage novice breakfast cooks to watch the video we’ve attached to the story before you begin. 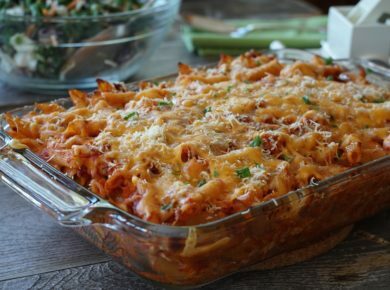 I also think you’re going to feel very proud of yourself after you make this recipe so keep it handy. It’s always a good idea to PIN our recipes to one of your Pinterest boards, but don’t forget to also share the joy with friends and family. Click the SHARE buttons on this post and video to let others in on this time-honoured classic. Are you ready to work some morning magic? 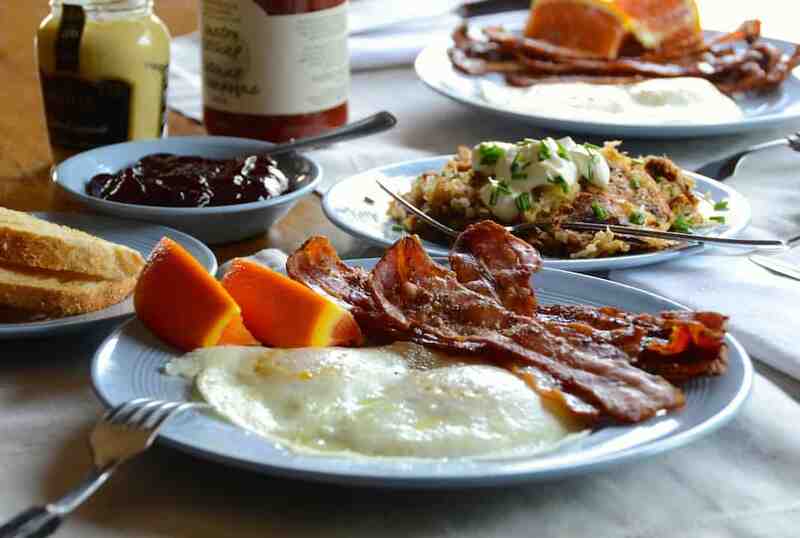 Let’s make the CLASSIC COTTAGE BREAKFAST OF BACON AND EGGS! 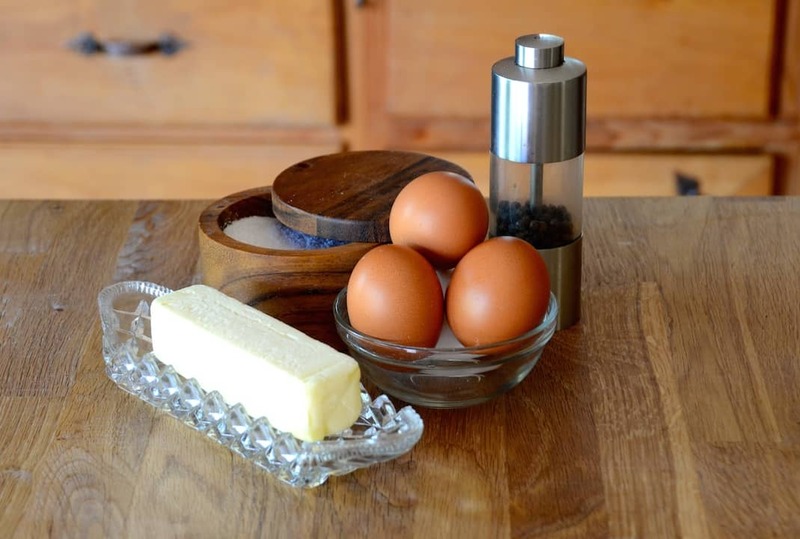 THE NIGHT BEFORE – Place your butter and the number of eggs you’ll be making (most guests will have two) out on the counter the night before. If you can, try to use farm-fresh organic eggs. Having these two ingredients at room temperature before you begin is important. HASH BROWNS – The goal is to serve crispy, evenly browned hash browns that give a nice crunch when we bite into them. 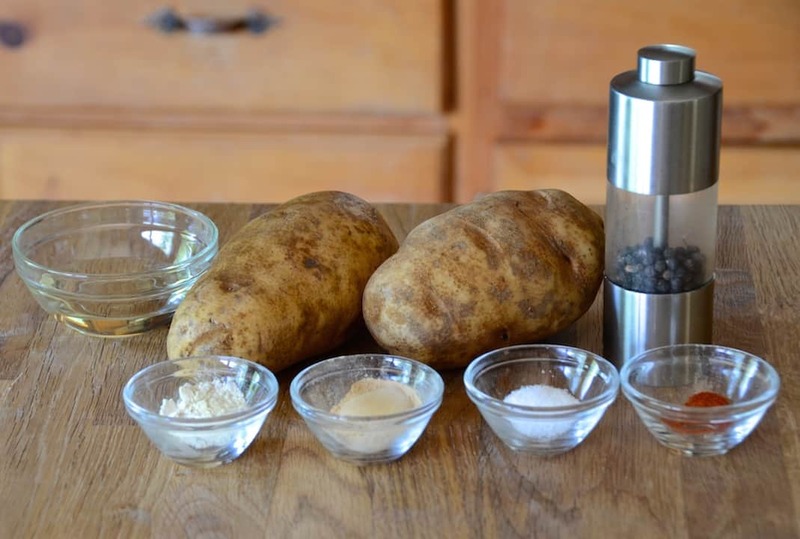 To accomplish this, we use russet potatoes – one per guest – that we peel and then shred using a box grater. The first key step is to place the shredded potatoes in a bowl of cold water for about 1-2 minutes. This will release the excess starch from the potatoes which in turn will prevent the hash browns from turning gummy when we cook them. Do this step twice, then strain the taters. Working in small batches, gather them up into a clean dishcloth and wring out the water. Doing them in smaller batches helps remove all of the excess moisture. Season the potatoes with onion and garlic powder, plus a bit of cayenne and black pepper and salt. You’ll need vegetable oil in a medium-sized skillet over medium-high heat to cook the potatoes. After the oil comes to temperature, add the potatoes and press them down firmly into the skillet using a flat turner or spatula. Cook the hash browns as directed. Break them into smaller portions and flip to ensure crispy clumps of this glorious treat. Once browned, rest them on a paper towel-lined plate to remove any excess oil right before you portion and serve with sour cream and chives. 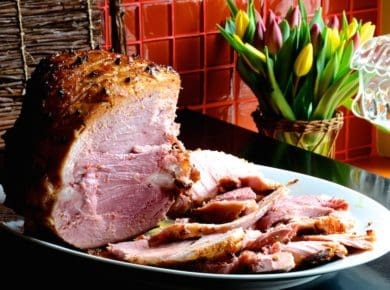 THE BACON – Yes, there was a time when I’d plunk my oversized cast-iron skillet onto the stovetop, fire up the heat and deal with the decidedly messy splatter of bacon fat as I cooked this flavourful meat. Thankfully, I’ve learned how to cook bacon in the oven, making for less mess, plus I always end up with evenly cooked rashers that come out of the oven perfectly crispy – the key objective. Oven cooked bacon is easy to do. 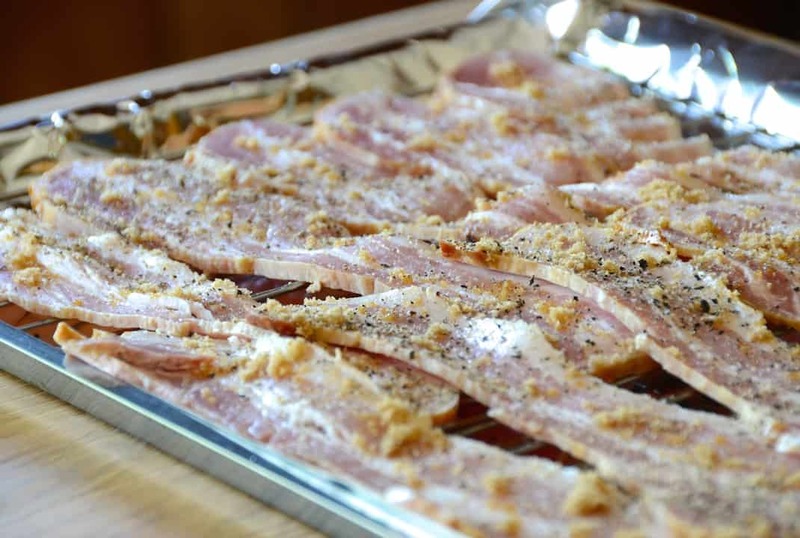 Preheat the oven to 400°F and place the bacon, thick-cut if you can find it, onto a foil-lined baking sheet. If you have a wire rack to place onto the sheet, even better as the fat will render into the pan. We’re telling you to add a tiny bit of brown sugar and black pepper to the bacon right before it goes into the oven just to make the flavours pop. The bacon will take maybe 13 minutes to cook this way, perhaps a bit longer for extra-crispy. 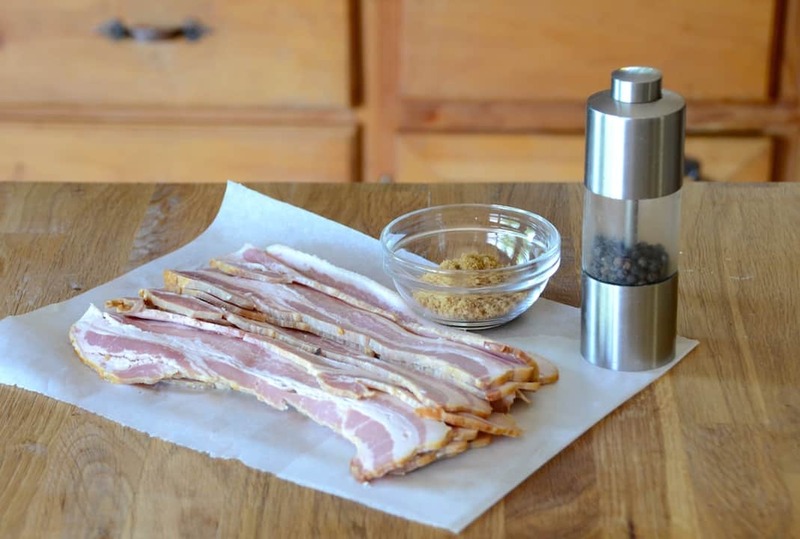 Because every oven cooks differently, and because bacon comes in a wide range of thicknesses, check things at the 10-minute mark to avoid burning. FRUIT & ACCOMPANIMENTS – Adding a bit of fresh fruit to your breakfast plate is always a good idea whether it’s fresh berries, melon or juicy orange wedges. Having a few condiments on the table is also a nice touch, things like gourmet ketchup, mustard, jams and jellies, each with a dedicated serving spoon. Looking for the ultimate jams to go with this delicious meal? 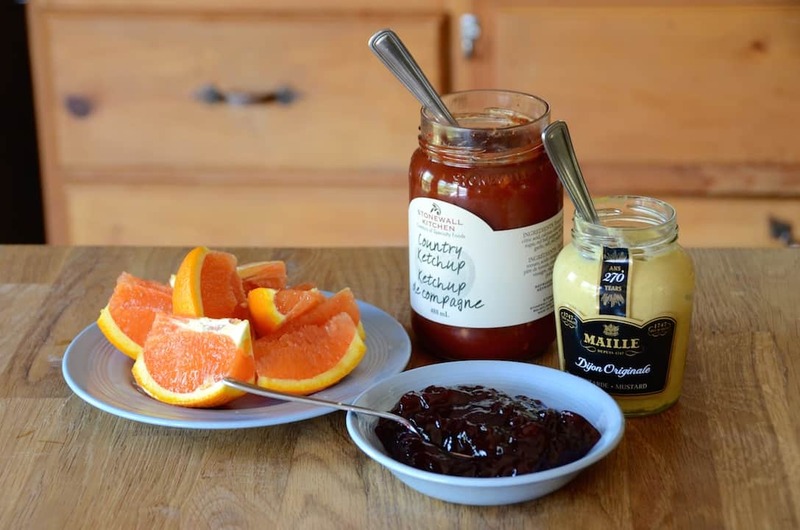 When time allows, try your hand at making NANCY’S APRICOT JAM or our LATE-SEASON STRAWBERRY JAM. Yum! THE EGGS – I’ve prepared the eggs here just the way I like them – over easy. Of course, to each his or her own, so, if you’d rather your eggs another way, by all means, prepare them accordingly. That said, I do think every at-home chef should be able to prepare eggs over easy since guests often request them this way. The concept is perfectly crafted – we cook two eggs in a knob of butter until the edges of the eggs turn white and bubbly. Then, with a flick of the wrist (yes, practice does make perfect) we flip the eggs – that’s the “over” part – and cook them for just a few moments longer, scooting them onto our breakfast plates while the yolk is still runny – that’s the “easy” part. One tip that may make this endeavor a bit easier is to crack your eggs in advance into small portion bowls. You’ll find this method way easier than cracking the shells on the edge of a hot skillet – no shell bits, less mess! 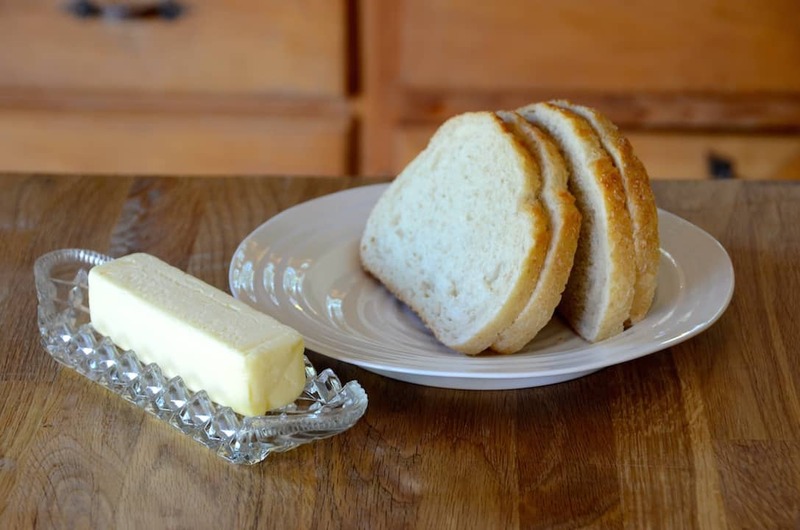 THE TOAST – Toast is the customary side for this breakfast and I’d like to suggest you follow my lead and make it using rye bread, complete with a swipe of butter. I love how rye bread gets all crunchy and gorgeously golden when toasted. 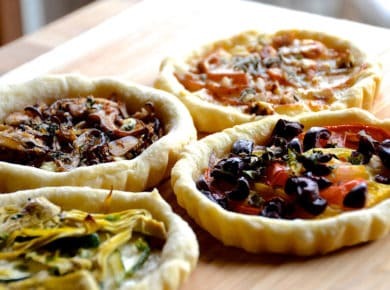 ORDER – Although the recipe instructions explain everything in detail, here’s a quick recap of the order or preparation, by the minute! Please note: I’ve listed the ingredients to accommodate two guests, so adjust accordingly if serving more. START – Heat the skillet and begin cooking the hash browns. Place the bacon in the oven. 5:00 minutes – Flip the hash browns. 7:00 minutes – Set the table, placing out with a few choice condiments as suggested above. Set breakfast plates out onto the counter and garnish with fresh fruit. 10:00 minutes – Check the bacon for doneness. Flip the hash browns some more. 12:30 minutes – Slide hash browns from the skillet onto a paper towel-lined plate. 13:00 minutes – Place butter for eggs in the warmed skillet. 13:30 minutes – Add eggs to skillet. Remove the bacon from the oven and blot on paper towels. 14:30 minutes – Flip the eggs. Place hash browns onto a serving plate, garnish and place onto the table. Begin toasting the rye bread. 15:00 minutes – Remove eggs from skillet and place onto a breakfast plate. Butter the toast. 15:30 minutes – Add a few rashers of bacon next to the eggs and serve immediately. Serve the rye toast on the side. This breakfast is always appreciated, and very well may be the quintessential morning offering that most people enjoy. 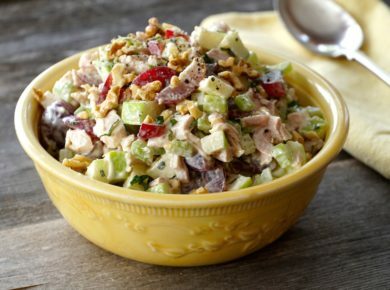 Serve it with juice, coffee, tea or one of our SMOOTHIES. Prepare our CLASSIC COTTAGE BREAKFAST OF BACON AND EGGS and rest assured, you’ll certainly have a good morning!